A mall scavenger hunt party is a popular party theme for teens. The Amazing Mall Scavenger Hunt party kit has everything you need to throw an awesome Amazing Race style scavenger hunt at your local mall. Hosting the party is fun and easy with this printable and editable scavenger hunt list. Each team gets their own color and list. Read on for more details! How to throw a Mall Scavenger Hunt! 1. Simply invite your friends to join the hunt. Invitations are included in the hunt materials. 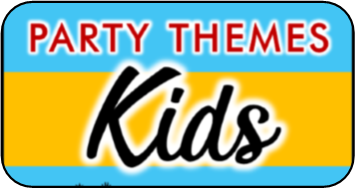 All you have to do is type your party information, print, and pass out to everyone you want to invite to join the fun. 2. Print out as many team badges as you’ll need for your guest. Included in the scavenger hunt is five different colored team badges. This mean you can have a total of five different teams competing in your mall scavenger hunt party, though you could also choose to have as few as two teams. The number of people that can be on each team is unlimited, but for ideal play I would suggest five or less on each team. 3. When guest arrive divide them into even teams and pass each member a badge representative of their team. 4. Next give each team a coordinating mall scavenger hunt list. This list is the most important part of the game. 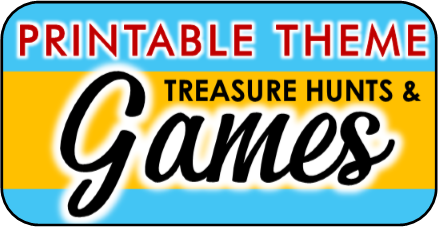 It has a variety of fun and crazy tasks, items, and photo ops that teams can earn points from. Most of all the items on the scavenger hunt list are things you must find or do. Very few of them require players to actually purchase any items, but there are a couple that requires a small amount of money such as “A picture of the entire group sharing a soda – each with their own straw”. This photo op would require the purchase of a soda. 5. On the start of go each team will have an hour and a half (two hours if you choose) to collect as many items on their mall scavenger hunt list as they can. Each team will be required to have a camera. You can ask guests to bring their cameras or you can provide a disposable camera for each team. 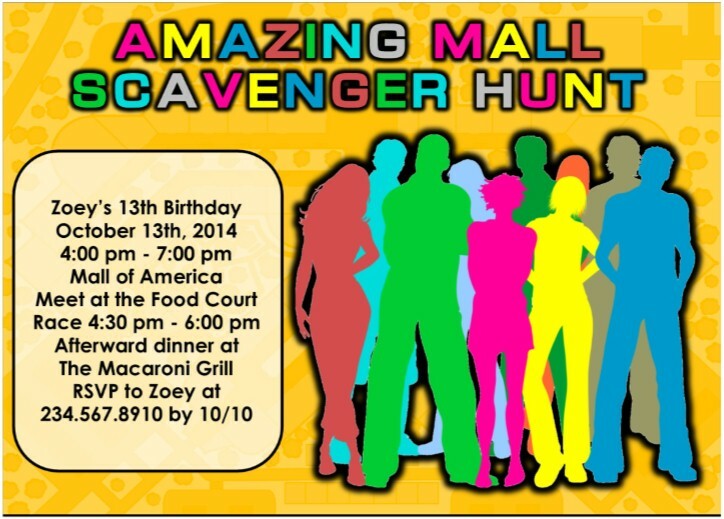 This full color invitation coordinates with the mall scavenger hunt list and team badges. It arrives to you in an EDITABLE PDF file. All you have to do is type in the details of your mall scavenger ( date, time mall location, and RSVP information) onto the invitation. Then you can print out as many as you need. 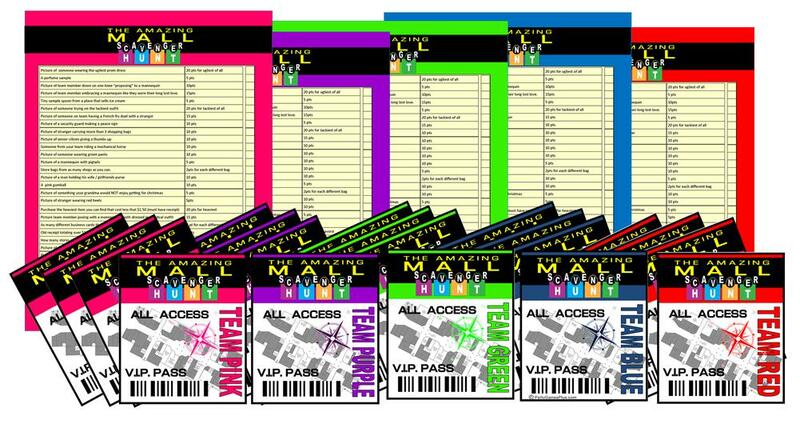 Printable Color Coordinated team Badges These badges are an awesome way to divide players up and identify the teams. They are ideal when attached to lanyards and worn around the neck. Team colors are red, pink, blue, purple, green, and yellow. These will be delivered in a ready to print PDF file. The kit comes with a list of 32 challenges that teams can pick and choose from, best of all if you want to add in your own challenges or replace some of the originals you can! These list come in editable files. Another great thing about this is that you don't have to rewrite all the list to change them. Change a challenge on one of the list and the files will automatically change the rest of the list to match! Picture of team member trying on ugliest prom dress – team with the ugliest receives 20 pts. get your amazing mall scavenger hunt kit now!